Thought you'd saved them all? Think again, as Abe stumbles across one last Mudokon hidden away in RuptureFarms, and it's one Mudokon that Oddworld fans might have heard about. 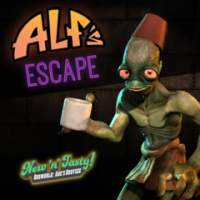 Set in all new never-seen-before areas of the factory, Alf's Escape is an $3 DLC expansion pack designed to challenge even the best New 'n' Tasty players.